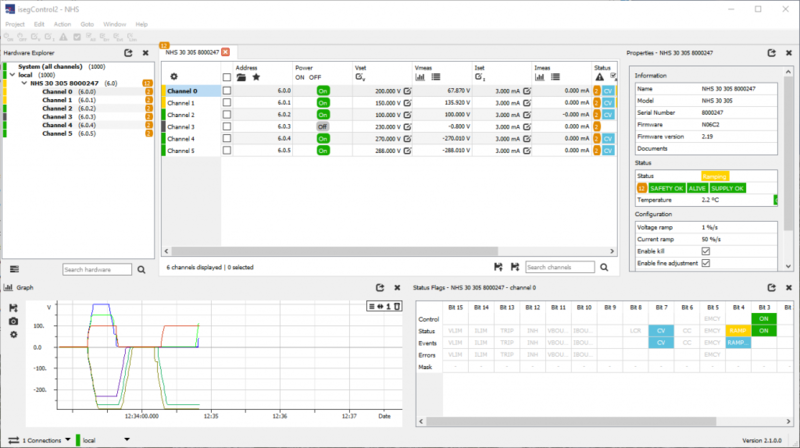 isegControl2 is a common project with iseg Spezialelektronik GmbH. This software is designed using the latest technologies. As a consequence it is the most sophisticated tool for handling iseg HV power supplies. The graphical interface looks great no matter if you are using Windows, Linux or Mac. All graphical components can be shown, hidden, resized or arranged in a different way. Therefore users can show a full featured display or concentrate on the basics! handles CC24 crates, SCPI controlled modules and socketCAN devices. includes powerful graphical analysis (BeSpice Wave Widget). defines channel profiles and folders. It is a perfect choice for controlling iseg hardware. Small setups will benefit from the possibilities of controlling NIM and desktop modules. The graphs representing the measured currents and voltages allow to detect problems or rare events. Larger experiments can access multiple CC24 crates at once. This simplifies complex setups. It gives an overview over a huge quantity of HV channels at once. It will inspire you when you are designing your own control software. Python scripts allows to write startup or shutdown programs for your experiments. You have full control over all parameters and measurements. Therefore it is possible to step through a voltage interval and perform measurements at each step for example. isegControl2 is available from the iseg web site -> support ->downloads -> software -> isegControl2. Don’t hesitate to contact us or your iseg support for questions and remarks. Our own control software Easy LV|HV was realized for Physical Instruments. It also controls Wiener MPOD crates over the Ethernet SNMP protocol. It is not as feature-rich as isegControl2. Nevertheless it might match your requirements just as well !